Gold is cheap relative to risk assets across the board. Here is an illustration of just how cheap it is relative to house prices in England. The central-bank inflated asset bubble spans the globe. Fortunately, so does gold, offering an inversely correlated investment with a historical track record of impressive returns while almost everything else is in freefall. As a store of value, it’s been awful. Every year it loses purchasing power, and the interest that is paid does not compensate the loss. Real inflation is much higher than the Bank of England’s traditional measures – RPI and latterly CPI – show. As of now, one ounce of gold is worth around £960. 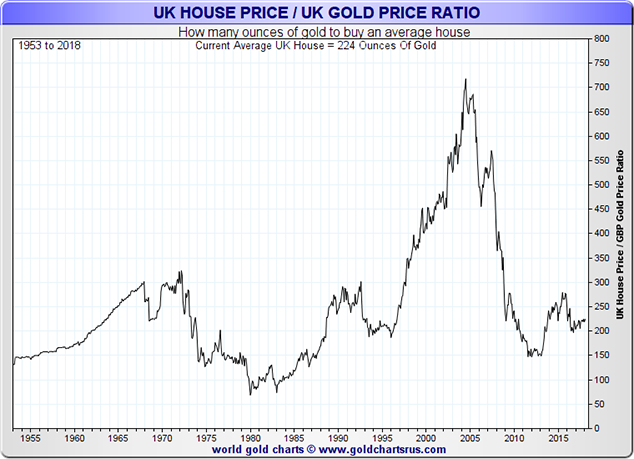 The average UK house is, according to the Nationwide, worth £211,625 – or 220 ounces of gold.